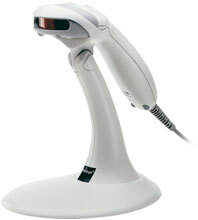 Metrologic MS9540 Voyager - SCANNER ONLY, 1D Laser Scanner. CodeGate and Low Speed USB interface. Color: Light Gray. Cables and accessories must be purchased separately. These include USB (Part# 53-53235-N-3), PS/2 (Part# 53-53235-N-3), or RS-232 Serial cables (Part# 53-53000-3) and a Power supply (Part# 46-00525). Non-Cancelable/Non-Returnable. The Metrologic MS9540-38 is also known as Metrologic Instruments	MS9540-38	or MS954038	.